Stick-N-Find Bluetooth Location Tracker with Key Fob is a device that allows you to track down the things you have misplaced. Never lose your keys again! Stick these Bluetooth personal tracking devices to keys, luggage, electronics and more, and use the free Stick-N-Find app to find, track and, get alerts of your items all from your smartphone. The Stick-N-Find product is a personal tracking device that works with iOS smartphones, tablets, and select Android devices supporting Bluetooth Low Energy. The App allows you to perform four great functions to aid you in tracking, monitoring, and retrieving personal items. 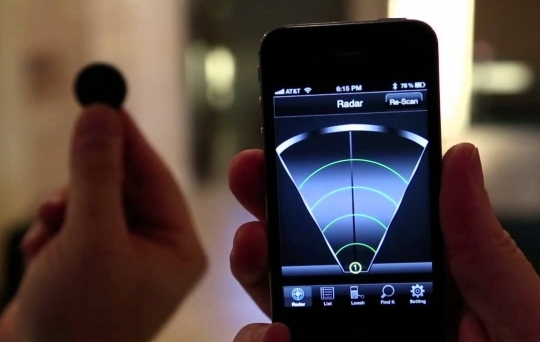 Use the Radar app to track up to 20 items at once within 150 foot range and locate lost items with your smartphone. Virtual Leash function alerts you if an object moves out of selected range. Stick-N-Find stickers have a buzzer and light, so you can find stuff in the dark. Trackers are about the size of a quarter, so you can stick them just about anywhere. When you use Stick-N-Find, your items are never far away.